Following a recent request, the next release of Metawidget will add support for XML Schema (XSD) files. 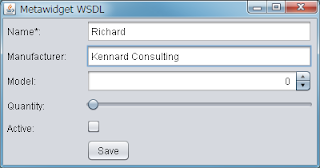 It should be useful for anybody wanting to automatically generate User Interfaces from XSD schemas, Web Services Description Language (WSDL) files, or SOAP. * Retrieve the values from the Document and put them in the Components. * Store the values from the Components back into the Document. Also - do you have any support offerings for less-than corporate use. I would like to purchase support for assistance with a personal research project integrating Metawidget and Stanford's Protege Frames - but being an individual and not a corporation 1500 exceeds my budget. Thanks again for a great offering! Thanks Richard. I downloaded the latest snapshot but the WsdlInspector and other new classes were not yet present in metawidget-all-3.3-20130318.024457-46.jar. WRT your response - Calling the inspector server side would work fine in my case. My apologies. Could you please try again now? And here is a simpler schema I am trying to process. I noticed that restrictions and annotations are creating issues for the inspector. I stripped the annotations from this example. Thanks for helping me test this new functionality! Could you please send a sample project to support@metawidget.org? I note in the code snippet you pasted above the 'metawidget.setPath' line appears corrupted? Can you please share a complete working solution/example which can generate the UI using an xsd and then binding an existing xml (based off the xsd above) to bind it to the generated UI ? Thanks for your interest in Metawidget! I'm unclear what you're asking for here. The project you described is basically what this blog already is! Seems you can't have annotation elements in your XSD? Yes, apologies. 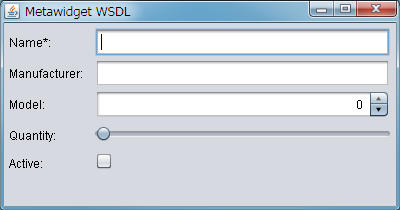 I am hoping to improve XSD parsing support soon. Contributions welcome!